I read them out of order. Not that it mattered, at least to me, but without the background it made it a bit … Odd. Sorry, talking about Batman and the “A Death in the Family” Story line. It wasn’t that I read those particular stories out of order. But instead I read a couple graphic novels out of order. Part of the problem is there are just so many Batman books to go through that you essentially have to pick something up and just start reading. Or you can be nit-picky and go to any of the thousands of sites available online, compiled by the neurotics that tell you the order to read any of the books and which books to read that coincide with the books you have in hand. All this to get a complete picture of the world you are delving into and so you don’t miss a thing. But not me. All of that is just too much work. Instead I peruse the titles and find ones I have heard about at least in small ways and grab the ones that interest me at any given time and what not. And all of that is far too many words to say that I read them out of order. See, what happened there was I picked up Under the Red Hood first. And then about a week later I picked up A Death in the Family. Both of these were the graphic novel compilations of the stories and for the most part they compiled a good number of the other stories that related to the main storyline. It makes for easy reading and allows you a chance to see how everything relates to the rest of it. And now I realize I am a bit into this and I haven’t really said anything that makes a lick of sense. So I should probably just get on with it. So, if you don’t know the storyline, A Death in the Family is the story where Jason Todd (the second Robin) was murdered by the Joker. The story originally came out in the late 80s. And much like the Killing Joke and the Dark Knight Returns it took a very dark turn for comics. For a villain to kill off countless unnamed people is one thing, I mean they are unnamed for gods’ sake. But to kill off a named character, a main character, well that just isn’t done. Under the Red Hood is a storyline where it appears that Jason Todd has been resurrected. So maybe you can see where reading them out of order can be a bit strange. Now, if you are up on the lore, there is going to be a bunch of stuff that I won’t even look at or explore here. The only things I will reference will come from those two books and the comics contained within. Heck, I might not even talk about the storyline as a whole at all. Basically, there is so much here we could spend years talking about it all. With all that said, let’s get into some of the thoughts about all of it. The first thing to consider is publication dates of the stories. 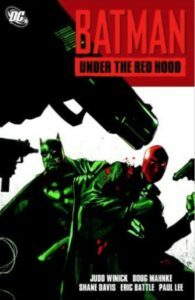 Under the Red Hood is a fairly recent storyline. In this storyline it is believed that Jason Todd has returned from the dead and he is now pursuing villains in his own way. The first thing noticed is the color palate used between the two different storylines. 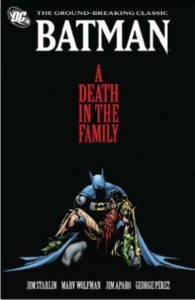 The original comics of A Death in the Family were the colors used in that time period by DC Comics. By today’s standards they can be a bit garish and maybe a bit too bright for such a deep storyline. They work great for a villain like the Joker because he looks a bit more clownish. It is almost comical when you see this circus clown with a smile on his lips pick up a crowbar to beat Jason Todd to death. Well, maybe not to death, more like just enough to get out some aggression before he traps him in a building with his mother and then blows the place up. I feel like there might be some comic irony in there, or maybe I am just a bit demented. The storyline is also written almost like a noir detective story. Throughout we have Batman’s internal monologue working through the events and how he has failed. He takes that blame on himself with the choices he made that led to the boy’s death. The story wouldn’t have been the same without that running monologue. Instead of just witnessing the events we are taken, through introspection, along for the ride. This gives us a deeper understanding and empathy for the situation. It isn’t just that a boy was killed by a madman, but someone we have a deep personally relationship with. This internal monologue is only present within the direct storyline of A Death in the Family. All the other books take the approach of allowing us to see the stories unfold as they happen. We have a distance much like the other characters who don’t have the same deep connection to the death as Batman. When it comes to the colors of Under the Red Hood, we are given more modern colors. Everything has changed in order to better fit more modern sensibilities and what we have accepted as the darker colors of darker comics. But there is another change within the the storyline itself that has ramifications outside the story. When we find Jason has come back from the dead he is much older than when he died. As a reader we can see this. We may not think much about it at least not right away. But there are a few places outside the storyline that makes this feel a bit more than coincidence. Sure they mention the time frame between his death and subsequent resurrection. But it is more than just that. The time span between the storylines is fairly large. In worlds where time is relative only to the story itself, that is a psychological move that affects the reader directly. It is an aging based on publication dates and I personally find it a bit funny. They used the dates against us. Mind you, they did use a story reason for the age discrepancy but it is fun to find the different aspects outside of just the storyline that might go unnoticed as well. One of the things I like about the collected editions other than just making it easier to read the entire storyline, is the bonuses. One of the things that they did during the run of comics was to put it up for reader vote to see if Robin lived or died. They actually produced both endings and in the graphic novel they shared the second ending where he lived (Granted I believe they shared that same ending in a different special issue as well but it is good to see it without having to search for it). Anyway, now that I have probably said nothing of value, I am going to sign off here. I will leave you with this though. Both of these graphic novels are some great reading. They show a bit of history of not only the Batman mythologies but also the changes in graphic novels over the years.